If you are preparing for this important exam and have thought or said this, you’re definitely not alone. I often hear this statement from candidates who are just starting to prepare for the PT exam and who want to just pass. I understand that it’s easier to just be pointed in a direction; however, there’s a lot of information to cover to prepare for the exam. While no, you don’t need to know everything to pass the PT board exam, you do need to be comfortable in all of the systems to pass. 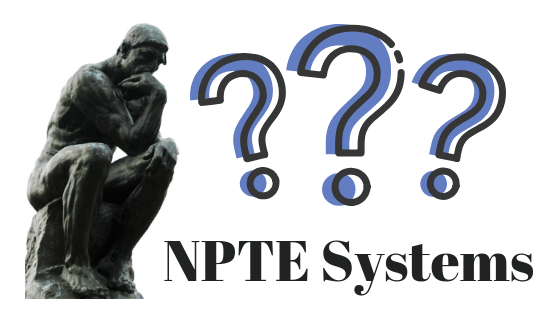 From Which Systems are the Commonly Missed NPTE Questions? Questions from systems that are most commonly missed are in the areas where you are not as strong. It may be obvious about missing in your weaker systems; however, when studying I’m finding that candidates are not focusing on their own areas first. What I find is that most study plans tend to follow more a generic academic approach and if copying from another candidate’s plan, the areas that may be needed to be strengthened for you aren’t addressed adequately. For each candidate preparing for the NPTE those missed questions from the nine systems are going to be different, just like your patients. In general, the majority of the questions missed on the NPTE happen to be in the core system foundations that include the Musculoskeletal, Neuromuscular and Cardiovascular / Pulmonary. The key is developing your own study plan specific enough to help you address the weaker systems first. Any combination of questions missed in these 3 areas can hamper a passing score. For example, I’m strong in Musculoskeletal; however, I’m not as strong in Neuro and I’m weakest in Cardiovascular. If I happen to miss a lot of questions in both Neuro and Cardio, that would bring my chances of passing the NPTE down significantly. However, let’s say I’m weak in Ortho; that by itself can bring me below passing since it’s approximately 30% of the exam. When the goal is passing, going in with just 70% would mean barely making it on the actual exam. Your goal is to aim for higher than the bare minimum score on the NPTE practice exam. Would Just Knowing the Core Systems Foundations be Good Enough to Pass? It depends on how solid you are on the core foundations and can apply the knowledge you gained in the program to the PT exam. However, the NPTE isn’t purely academic as the exam questions asked will want you to relate the material to clinical applications. This means being able to integrate different portions of what you learned academically and applying them to the scenario presented to you. The majority of the time the answer to the above question will be ‘No,’ it’s not good enough to just know the core systems as many have been unsuccessful with this bare minimum level of preparation. What About the Other Systems? While you’ll want to be sure you can pass with the main 3 systems for the NPTE, there’s still about a third of the physical therapy board exam that asks you questions about the 6 other systems. These systems include Integumentary, Lymphatics, Metabolic and Endocrine, Gastrointestinal, Genitourinary and System Interactions. There are some general NPTE changes that you’ll want to be familiar with based on the latest FSBPT blueprint format. So, What Areas Should I Focus On? When studying, focus first on your areas of weakness that can make a difference on the exam. Alternate that with areas where you are stronger and then follow up with another weaker area. This is what I call a sandwich approach and this strategy will help you to retain the information better. Let’s say that you are weakest in the Neuro system, then the Cardio system and then Musculoskeletal. With the sandwich approach, I’ll start off with studying Neuro then follow with Musculoskeletal, and finally Cardio. The idea is that you can make an impact on your scores by focusing on the common areas from the core systems that can be improved on first. Essentially, you want to study where you can gain the most amount of points first, as this will also build up your confidence. Then you can focus on areas that may be one or two questions to help you overall on the NPTE. You should be able to answer any question on the NPTE by the time you go to take the exam. You should be comfortable and confident with any system that is presented to you, regardless of your strengths or weaknesses. There still may be “weaker” areas; however, let’s turn each of the currently weak systems now into your strengths.